Romeo has called some amazing cities home. Originally from Bucharest, Romania, he has also lived in Sélestat on the German border of France, St. Augustine, Ft. Knox, Anchorage, and Spartanburg, before settling here on the border of Coastal North and South Carolina. 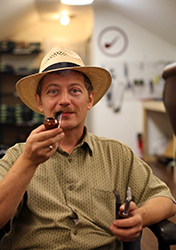 Romeo's hobby is not only pipe smoking, but also cleaning and restoring. As our one of our Pipe Restorers, Romeo breathes life back into so many of the estate pipes that come through our door. When he isn't at what he refers to as his dream job, or smoking a pipe, he enjoys taking his daughter, Georgiana, to Ocean Isle Beach for walks and star gazing. Good food is in their genes, he says: the two often cook traditional Romanian food together since nothing tastes better to him than the food he grew up with.